Chappie is an adorable film about an impoverished, annoying, pointless, stupid, so-sincere-it’ll-give-your-foot-a-headache, mentally subnormal man named Blingwad 6000 who just wants to own his very own human son, but is incapable of figuring out how to produce or steal a real alive one, so resorts to building one out of some bits of metal he found in a skip in Sarth Ifrika. If bells are ringing in your head-place right now then 10 points for you because yes this is indeed a space age sequel to the tale of old man Geppetto and his daft-in-the-head wooden son Pinocchio. SPOILER ALERT Blingwad 6000 is revealed to be Geppetto’s great-great-great-great-grand-nephew at the end of the film! Safe to say he is a perfect casting and you will grow to loathe his very existence in this or indeed any universe or inter-dimensional reality matrix by the end of his first few seconds on screen. Blingwad is repeatedly thwarted in his quest to construct his metal offspring by a life form known as a “mullet” which has cunningly disguised itself as a psychotic Steve Irwin. Mullet fears a world full of robot children and wishes to force Blingwad to have a real biological son, but not being an actual human doesn’t quite understand how that works. Mullet also carries a gun on him at all times, which is perfectly normal practice for someone who works in a room full of sweaty nerds. In my office we all carry guns all the time and are constantly threatening each other with them, so I know this is very realistic. Full marks for injecting some realism in to proceedings, Director Blomkamp! Despite Mullet’s repeated gun-threats and misguided attempts at human procreation Blingwad eventually succeeds in creating his own “metal chappie” and names him “Chappie”, because that’s a very good name when you live in a violent gang neighbourhood in Sarth Ifrika. The film shows him making Chappie’s consciousness by hand-coding 570GB of Node.js line by line, which is also very realistic. Talking of realism, Mullet later uploads another 570GB of evil-Node.js to Chappie’s magical computer-brain near instantly, but then takes 35 minutes to delete the local copy of the file. 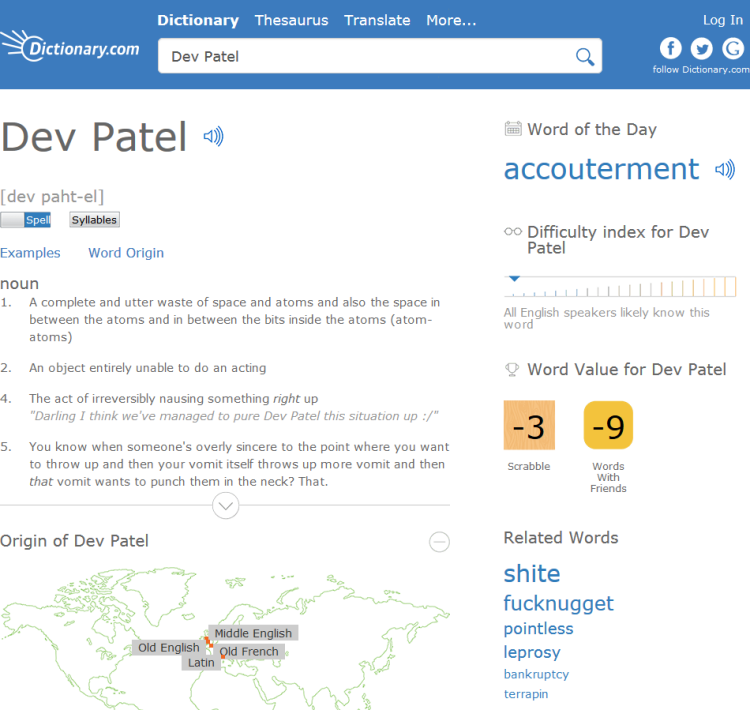 The entire network and Chappie’s stupid brain also blindly accept the evil-Node.js without question, with only Blingwad’s own laptop identifying it as harmful! Why, Director Blomkamp, with all this realism you are spoiling us! REALISM YOU SAY!?! Chappie eventually gets taught that “this is a watch” and repeats the word “watch” despite only moments earlier it being indicated that he had no grasp of English, so would have had no means of separating the sounds “this” and “is” and “a” and “watch” and figuring out which sound was part of which word and which word meant what. Oh Director Blomkamp, stop, you dreadful tease you; with all this realism and thought having gone in to the plot I may just evaporate right now so giddy am I with the joy of it all! 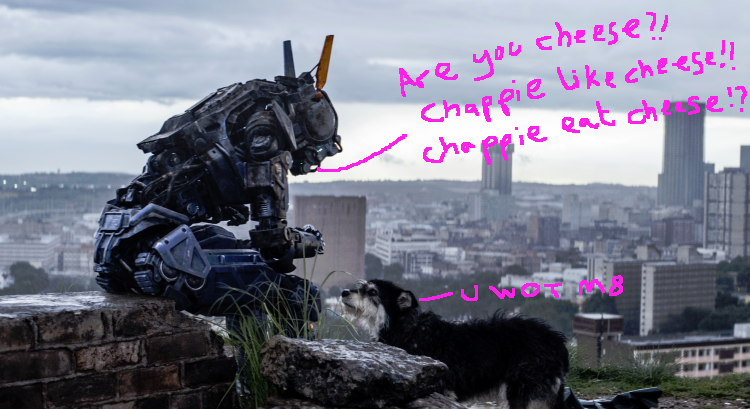 TL;DR As a film it’s pretty awful and full of plot holes and terrible actors and really bad casting, BUT (and it’s a pretty big BUT which is why I did it in capitals and bold and italics and underlined because SYMBOLISM) Chappie and Ninja & Yolandi are great. The film is basically just one long Die Antwoord music video anyway, and they’re brilliant. I give the film itself 0 out of 1 (binary! because computer!) and Chappie & Ninja & Yolandi 8 out of 10 of DADDY’S STOLEN CARS!! !